About the origin of "pho cuon", this speciality was available in Ngu Xa village about 20 years ago. A restauratuer of a small vendor serving food at night came up with the idea wrapping beef and vegetables by sheets of uncut "pho" noodles (rice papers) when the broth ran out. Since then, "pho cuon" has become a special and popular dish in Hanoi. The famous Hanoi by the fussy, meticulous, careful not only in his eating, speech, behavioral, lifestyle is also reflected even in the food culture. Today, the bustling life makes the kitchen there was plenty of room for family meals billion rash, thorough, characterized Business ethereal States as Bun Thang. Talk about Hanoi, you will image about the Old Quarter, cyclo, Alstonia flowers or Hanoi cuisine with typical dishes of the capital, in which the one can not forget – Phở Hanoi. 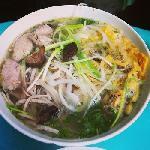 The Second ranking Pho of Vietnam - Pho Ga!